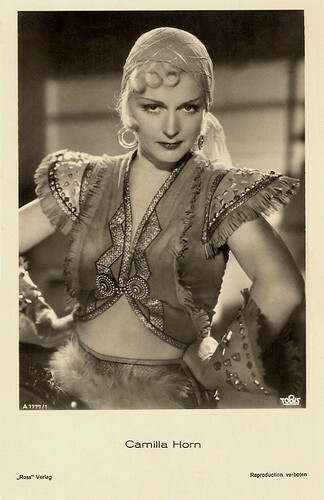 Ethereally blonde Camilla Horn (1903 - 1996) was a German dancer and film star. 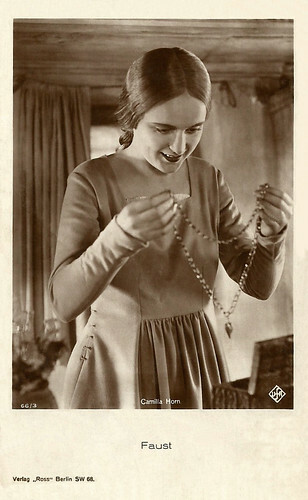 Her breakthrough role was Gretchen in the silent film classic Faust (1926, Friedrich Wilhelm Murnau). 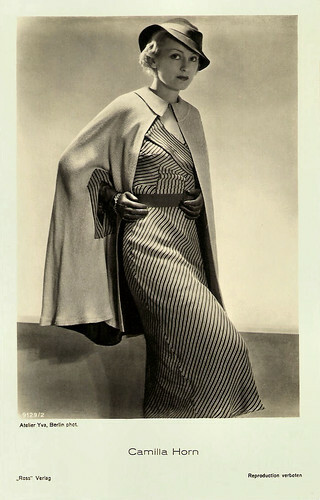 She also starred in some Hollywood films of the late 1920's and in a few British and Italian productions. German postcard by Ross Verlag no. 1806/1, 1927-1928. Photo: Ufa. German postcard by Ross Verlag, no. 3944/2, 1928-1929. Photo: United Artists. German postcard by Ross Verlag, no. 3154/1, 1928-1929. Photo: Atelier Binder, Berlin. German postcard by Ross Verlag, no. 6648/1, 1931-1932. Photo: Atelier Schneider, Berlin. 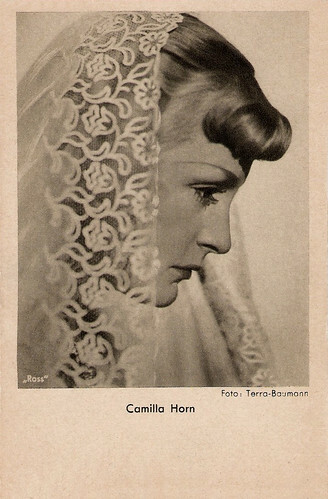 Camilla Martha Horn was born in Frankfurt am Main, Germany, in 1903. She was the daughter of a civil servant. Horn was educated as a dressmaker and worked at Erfurt. 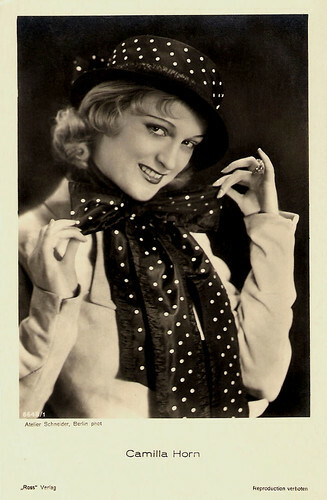 She took dance lessons and made her stage debut as a dancer in a cabaret. 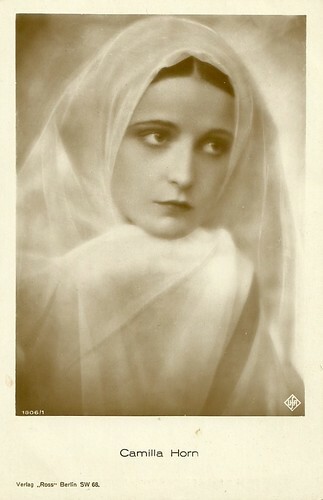 Her film debut was in the Alexandre Dumas père adaptation Kean (1921, Rudolph Biebrach). In the following years she had a few appearances as an extra. 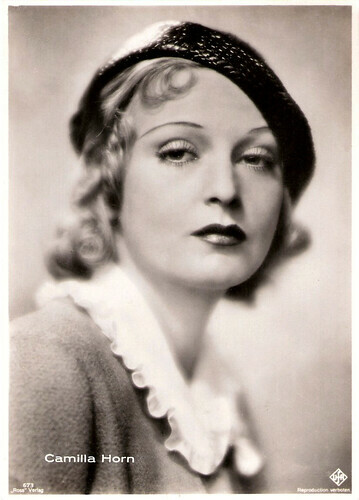 In 1925, she worked as an extra in Madame wünscht keine Kinder/Madame Doesn't Want Any Children (1925, Alexander Korda) with Marlene Dietrich, and in Tartüff/Tartuffe (1925, Friedrich Wilhelm Murnau) she was a double for the female star, Lil Dagover. German postcard by Ross Verlag, no. 66/2. Photo: Ufa. 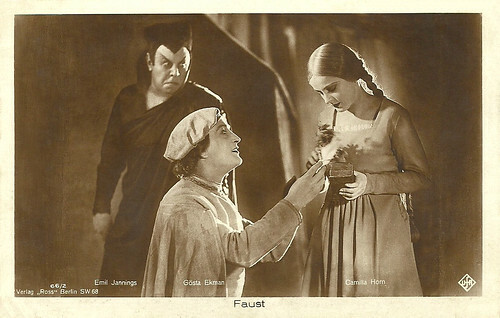 Gösta Ekman, Emil Jannings and Camilla Horn in Faust (1926). Collection: Didier Hanson. German postcard by Ross Verlag, no. 66/3. Photo: Ufa. Publicity still for Faust (1926). German postcard by Ross Verlag, no. 62/3. Photo: Parufamet. Publicity still for Faust (1926). German postcard by Ross Verlag, no. 62/8. Photo: Parufamet. Publicity still for Faust (1926). German postcard by Ross Verlag, no. 66/6. Photo: Ufa. 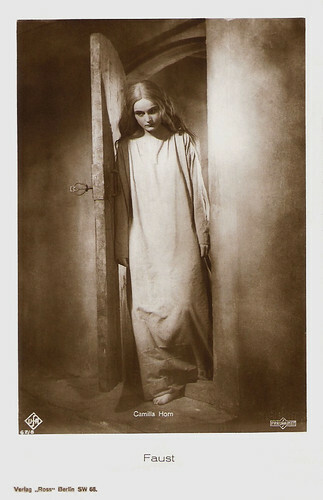 Publicity still for Faust (1926). 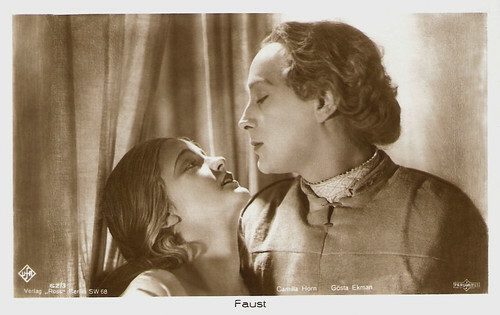 Camilla Horn's great chance came when director Friedrich Wilhelm Murnau prepared a film version of Goethe's Faust. 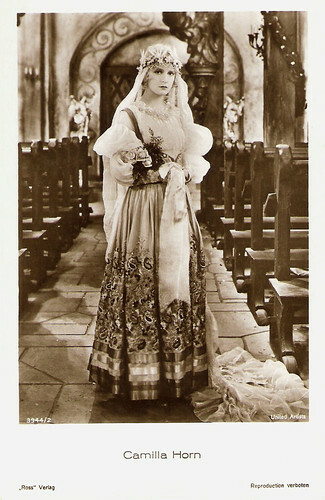 He had asked Hollywood star Lillian Gish to play Gretchen in the lavish Ufa production, but she insisted that the film should be shot by her favorite cinematographer, Charles Rosher. Therefor, Murnau decided to cast the newcomer he had met on the set of Tartüff. The completely unknown Horn proved to be the ideal casting for the role and Faust (1926, Friedrich Wilhelm Murnau) made her a star. 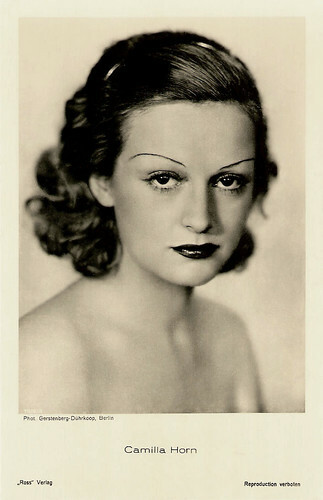 She signed a four-year contract with the Ufa and acted in Jugendrausch/Youth Frenzy (1927, Georg Asagaroff, Wladyslaw Starewicz) and Der fröhliche Weinberg/The Merry Weinberg (1927, Jacob Fleck, Luise Fleck). German postcard by Ross Verlag, no. 4449/1, 1929-1930. Photo: Atelier Schrecker, Berlin. German postcard by Ross Verlag, no. 5049/1, 1930-1931. Photo: Atelier Binder, Berlin. Austrian postcard by Iris Verlag, no. 3705. 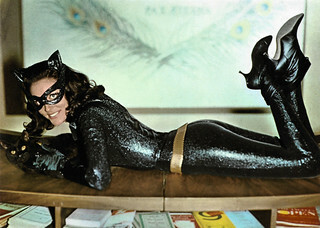 Photo: Verleih Dr. Hauser & Co. / United Artists. German postcard by Ross Verlag, no. 5264/2, 1930-1931. Photo: Deutsche Universal. German postcard by Ross Verlag, no. 7916/2, 1932-1933. Photo: Gerstenberg-Dührkoop, Berlin. 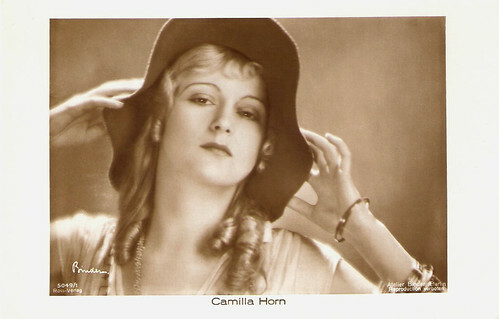 In 1928 Camilla Horn sailed for Hollywood where she became the mistress of producer Joseph Schenck and played in two United Artists productions. 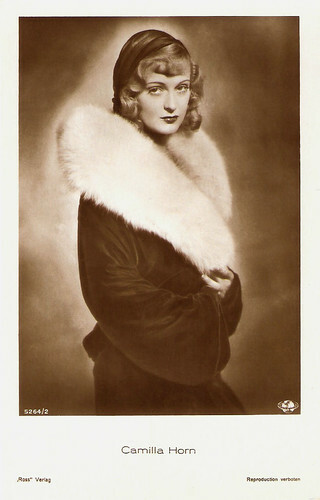 She starred in Tempest (1928, Sam Taylor) and in Eternal Love (1929, Ernst Lubitsch) both opposite John Barrymore. 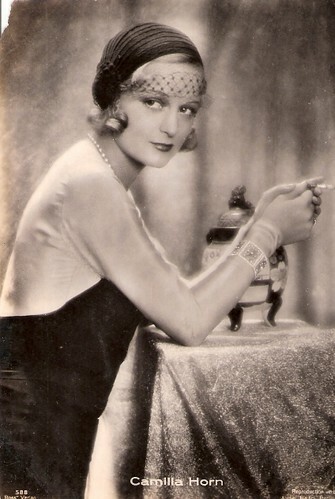 She returned to Europe, and made popular films like Die grosse Sehnsucht/The Great Desire (1930, Steve Sekely), Hans in allen Gassen (1930, Carl Froelich) with Hans Albers, Moral und Liebe/Morals and Love (1933, Georg Jacoby), Die grosse Chance/The Big Chance (1934, Victor Janson), Ein Walzer für dich/A Waltz for You (1934, Georg Zoch), Der rote Reiter/The Red Rider (1935, Rolf Randolf), Gauner im Frack/crook in Tails (1938, Johannes Riemann) and Fahrendes Volk/Driving People (1938, Jacques Feyder) again at the side to Hans Albers. She refused to follow the official line of the Nazis and was prosecuted for a monetary offense. During the war she got only minor parts or she acted in Italian productions like Paura d'amare/Fear of Loving (1942, Gaetano Amata). 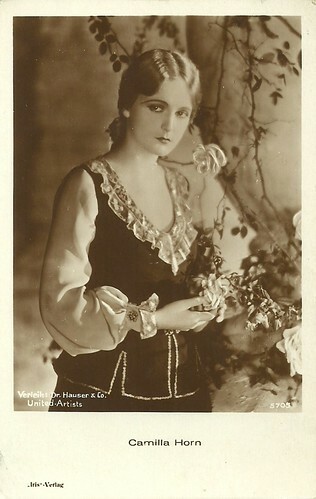 British postcard in the Filmshots series Film Weekly. Photo: B.I.P. 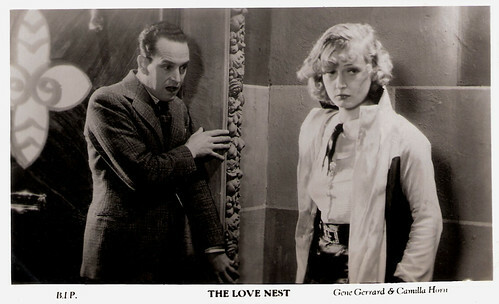 Publicity still for The Love Nest (1933, Thomas Bentley). German postcard by Ross Verlag, no. 4845/1, 1929-1930. Photo: Alex Binder, Berlin. German postcard in the Ross Luxus series by Ross Verlag, Berlin, no. 673. Photo: Ufa. German postcard by Ross Verlag, no. 588. Photo Atelier Balazs, Berlin. German postcard by Ross Verlag, no. 9129/2, 1935-1936. Photo: Atelier Yva, Berlin. German postcard by Ross Verlag, Berlin, no. 5779/1, 1930-1931. Photo: Atelier Binder. 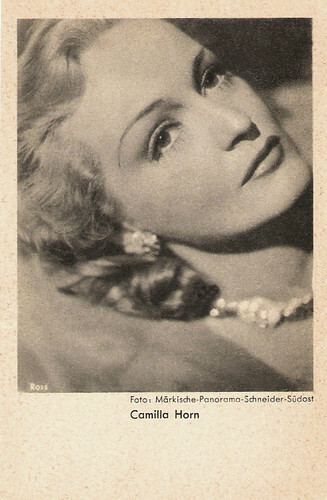 The German cinema of the post-war years offered Camilla Horn only rarely roles in films like Königin der Arena/Queen of the Arena (1952, Rolf Meyer) and Vati macht Dummheiten/Daddy Does Dumb (1953, Johannes Häussler). 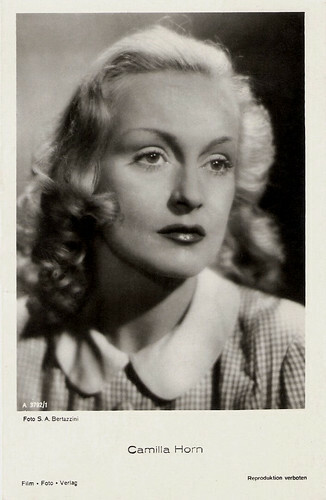 Late in life, she made a comeback in Schloss Königswald/Castle Königswald (1988, Peter Schamoni), a hommage to former film stars like Camilla Horn as Marianne Hoppe, Carola Höhn, Marika Rökk and Rose Renée Roth. The all-star cast was awarded the Bavarian Film Award for Best Actress of 1988. Her last appearance was in the TV drama Die Spinnen/The Spiders(1989, Pál Erdöss). 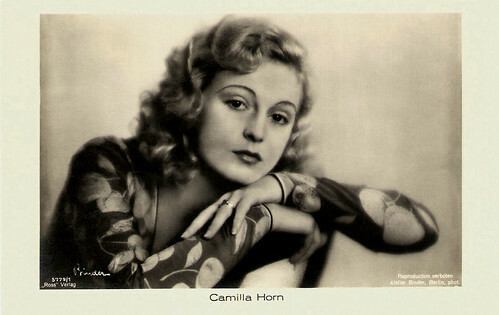 Camilla Horn died in Gilching, Germany, in 1996. German postcard by Ross. Photo: Terra-Baumann. German postcard by Ross Verlag, no. A 1777/1, 1937-1938. Photo: Tobis. 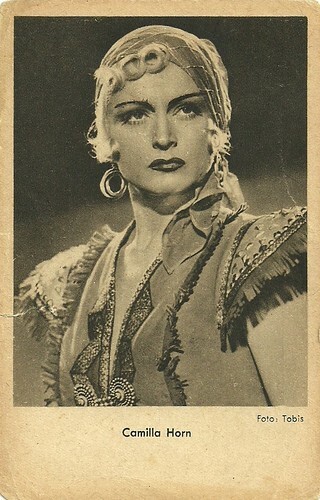 German postcard by Das Filmprogramm von Heute. 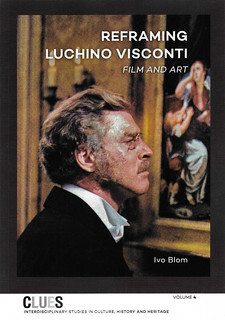 Zeitschrift für Film und Theater. Photo: Tobis. 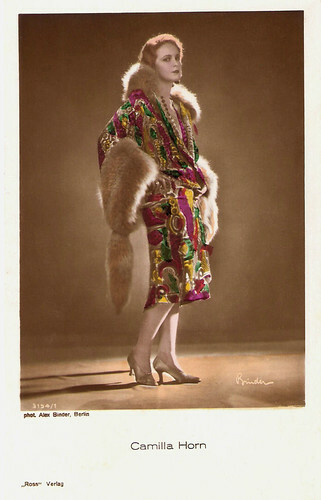 German postcard by Ross / Das Programm von Heute, Berlin. Photo: Märkische - Panorama - Schneider - Südost. 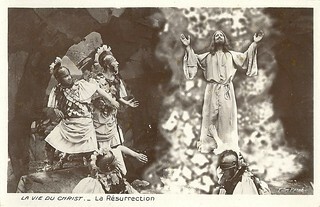 German postcard by Film-Foto-Verlag, no. A 3792/1, 1941-1944. Photo: S.A. Bertazzini. Sources: Thomas Staedeli (Cyranos), Hal Erickson (AllMovie), Wikipedia, and IMDb.